New Delhi, Dec 4: India's bowling coach Bharat Arun today took a dig at the Sri Lankan cricketers, stating that home team captain Virat Kohli did not require anti-pollution mask to bat for nearly two days in the third Test here. 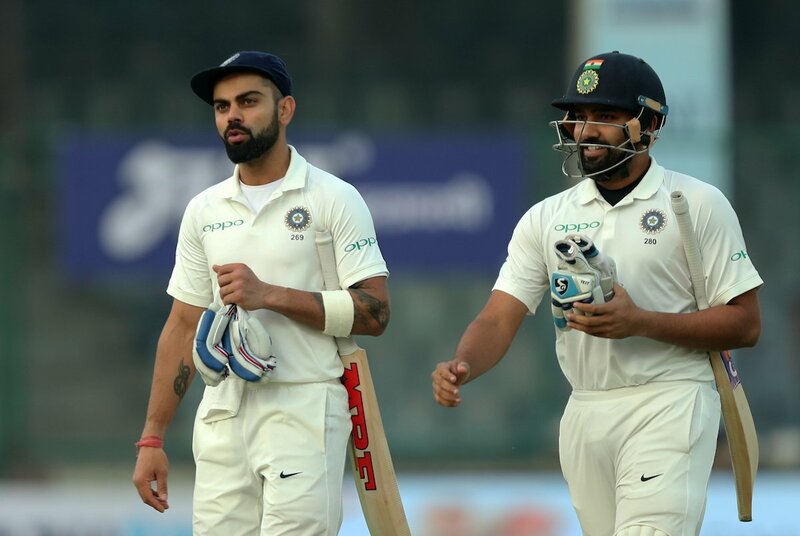 Kohli struck a career-best 243, batting nearly seven and half hours and he was the last home side batsman dismissed on a controversy-marred second day when Sri Lankan players forced an Indian declaration by halting play for 26 minutes, citing uneasiness due to poor air quality caused by smog. All the Sri Lankan fielders were wearing anti-pollution masks while fielding during the post-lunch session. "Virat batted close to two days. He did not need a mask. We are focussed on what we need to do. The conditions are the same for both teams and we are not too bothered about it," Arun said when asked if his players were affected by the smog. The coach then went on to wax eloquent about skipper Kohli. "His absolute focus is one thing and attention to detail is the key. In terms of fitness and game preparation, he is spot on. He is an example of what you need to be as a cricketer." Arun said that he would not call the declaration totally forced as they were pretty close to their target score of 550. "We were looking at a total of 550. It was pretty close to that. So we thought we might as well declare," the India bowling coach said. At one point in time, chief coach Ravi Shastri was seen getting onto the field to have a chat with the umpires. Asked about it, Arun said: "Ravi's take was pretty simple. He said 'please get on with the game, you don't need to stop. You take a decision and just get on with the game." The former Tamil Nadu pacer feels that it's not for players to protest and stop the match as there are match officials (match referee and umpires) assigned for a job. "I think the umpires and the match referee have a job on hand and it's not up to the players to go and protest. They know what they are doing. When the play was unnecessarily being stopped, we just wanted to get on with the game because our focus is to win this Test match," Arun said. He made it clear that the Indian team was not too worried about the pollution. "I think pollution is everywhere in our country. This pollution levels are serious in our country. I don't think we were too worried about pollution. The BCCI scheduled this matches and our job is to get the best out of our team. Focus is more on that." Interestingly, Arun was the Hyderabad Ranji team coach when his side's match against Tripura at Karnail Singh Stadium here was cancelled due to smog last year. In fact, two Ranji matches in the national capital were cancelled last year. The other match was between Gujarat and Bengal at the Feroz Shah Kotla. Arun agreed that to a certain extent the Sri Lankan protest could have broken Kohli's rhythm. "They wanted to probably stress upon the pollution part and our focus was totally different," Arun said sarcastically. "It could have broken his (Kohli) rhythm. Yes, but at that point, we had to move on and Ravi had to go into the field and tell the umpires to get on with the game." That the Indian team was irritated with the Sri Lankan antics was evident when someone quizzed if he felt pity for Sri Lankan fast bowlers, as he was a fast bowler himself. "We are focused on what we have to do and what we need to do to win the Test match. I don't think we need to be thinking about what the opposition does. It's their outlook. It's their problem to keep their bowlers fit," he answered smugly.